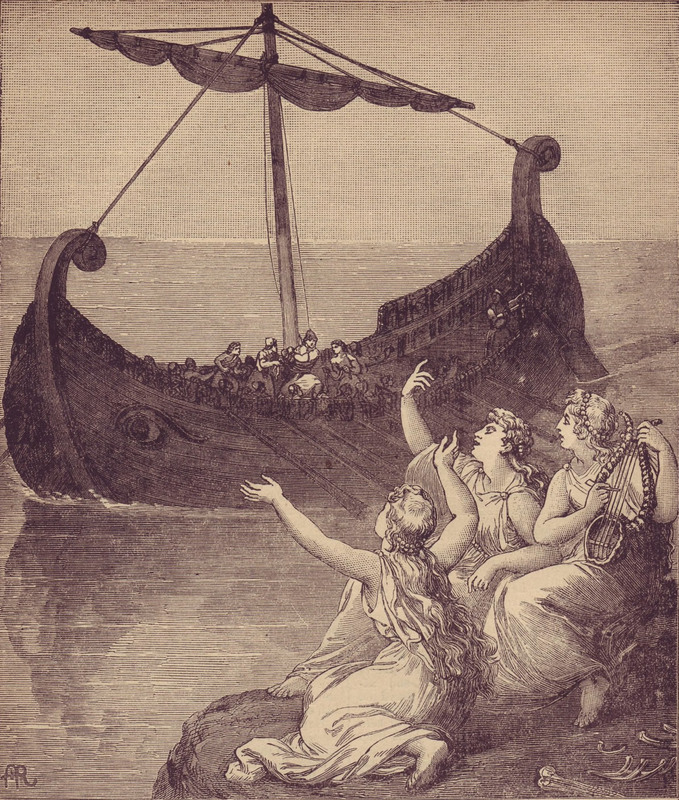 In The Odyssey, Homer recounts Odysseus’ run-in with the Sirens, beautiful creatures whose alluring song cause sailors to shipwreck themselves in an attempt to find the source. Odysseus, curious to hear the Sirens’ song yet fully aware of the danger, had his men tie him to the mast of the ship and plug their ears with beeswax. When they passed the island where the Sirens lived, Odysseus strained at his ropes and shouted for his men to release him, but the ropes and beeswax held. In the end, they passed by safely. I recently heard pastor Rock Dillaman pointed out that The Argonautica‘s Jason had a different response to the Sirens’ song. Warned by Chiron, Jason took Orpheus with him on his voyage. When the Sirens began to sing, Orpheus took out his lyre and played a song of greater beauty, drowning out their voices. The Argonauts, too, passed by safely. I’m a sinner, and a bad man. My problem, unfortunately, is not that I don’t know what’s right; I do. My problem is not even that I don’t know how to do what’s right; I certainly do. No, my problem is that when I sin, I love what is wrong far more than I love what is right. I suspect that, in this, I’m pretty representative of Christianity as a whole. With this being the case, it seems strange to me that the majority of biblical instruction I’ve received over my lifetime has sought to address my actions and not my love. Most of the sermons I’ve heard have been full of injunction with no motivation. The church seems to be full of teachers who assume their hearers don’t know that lying is wrong. Pastors and teachers, what your people need is to see and know and taste and believe that Jesus is better than sin. They need you, week after week, to open your Bible and play in such a way that the siren song of sin jars in their ears. They need you to set before them the truly awesome benefits of their union with Christ. They need to know that they’ve been invited to “a feast of rich food, a feast of well-aged wine, of rich food full of marrow, of aged wine well refined” (Isaiah 25:6). How sweet did it at once become to me, to want the sweetnesses of those toys! and what I feared to be parted from, was now a joy to part with. For Thou didst cast them forth from me, Thou true and highest sweetness. Thou castest them forth, and for them enteredst in Thyself, sweeter than all pleasure, though not to flesh and blood; brighter than all light, but more hidden than all depths, higher than all honour, but not to the high in their own conceits. Moralism, the biblical hermeneutic which interprets every text as a lesson in good behavior, is a poison. It slowly saps the will of spiritual motivation, because it can give no real reason or hope for laying aside the weights which entangle. It says nothing of Christ, his sinless life, his substitutionary death, his union with his people by his Spirit. Moralism dresses up the old man, but it cannot bring him to life. What the church needs– what the church has always needed– is a new heart. All the new clothes in the world will not do. By faith Moses, when he was grown up, refused to be called the son of Pharaoh’s daughter, choosing rather to be mistreated with the people of God than to enjoy the fleeting pleasures of sin. He considered the reproach of Christ greater wealth than the treasures of Egypt, for he was looking to the reward (Hebrews 11:24-26). Daniel, You may have seen this Sermon Jam. https://www.youtube.com/watch?v=VeKgfUGtcI0 If not you need to watch it. I believe it is a prime example of your “Better Song” philosophy. Reblogged this on Theology and Apologetics. The Topics, The Problems, The Glories..